Leading Exporter of botropase, inapure, neuro gardian, gtn sorbitrate cr, angispan tr and acitrom from Nagpur. Botropase is used in Surgical, urological, dental, gynaecological, and other haemorrhage. Botropase(Haemocoagulase) contains two different types of enzymes acting on blood coagulation; of which one has thrombin like action and the other one has thromboplastin like effect. Thus it promotes and accelerates physiological process of haemostasis. It shortens the bleeding time and coagulation time. 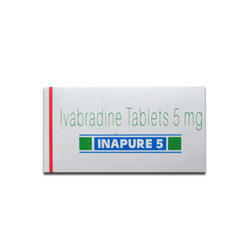 Inapure(Ivabradine) is a used to treat symptomatic stable angina pectoris (chest pain), chronic heart failure. It can be used in combination with standard therapy, including beta-blocker therapy or when beta-blockers are contraindicated or not tolerated. Inapure(Ivabradine) mainly works by reducing the heart rate by a few beats per minute which lowers the heart's need for oxygen especially in the situations when an angina attack is more likely to happen. In this way, it helps to control and reduce the number of angina attacks and further helps to improve the heart functioning and vital prognosis in affected patients. 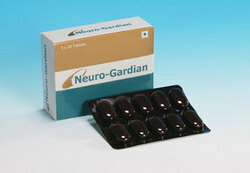 NEURO-GARDIAN is a formula designed to reduce the risk of secondary stroke, post stroke neurological deficits and associated cognitive impairment. Glyceryl trinitrate (GTN) is an alternate name for the chemical , which has been used to treat angina and heart failure since at least 1870. Despite this, the mechanism of nitric oxide (NO) generation from GTN and the metabolic consequences of this bioactivation are still not entirely understood. In medical circles it is often referred to as "nitro." 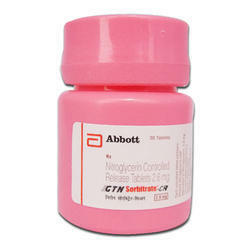 Angispan Tr is used in the prevention and treatment of the chest pain associated with angina (when the blood supply to the muscles of the heart is restricted). 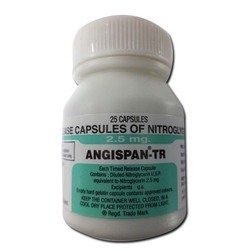 Angispan Tr belongs to a group of medicines known as nitrates. Nitrates temporarily relax smooth muscles, including those found in the walls of blood vessels in the heart. This reduces strain on the heart by making it easier for it to pump blood. 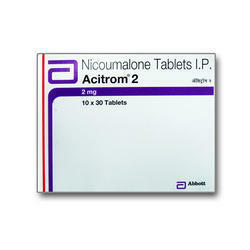 Acitrom contains Nicoumalone which is an anticoagulant that functions as a vitamin K antagonist. It is a derivative of coumarin and is marketed under the brand names Sintrom and Sinthrome. Anticoagulants decrease the clotting ability of the blood and therefore help to prevent harmful clots from forming in the blood vessels. These medicines are sometimes called blood thinners, although they do not actually thin the blood. 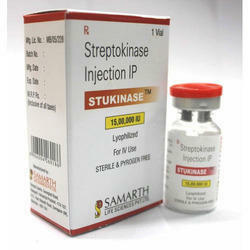 Uses of Stpase: Acute myocardial infarction, Arterial thrombosis, Deep vein thrombosis, Desloughing wounds, Duodenal ulcer and gastric ulcer, Myocardial infarction, Prophylaxis of NSAID-associated gastric or duodenal ulcer, Pulmonary embolism, Thrombosis. 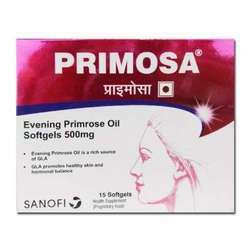 Primosa is used for treating rheumatoid arthritis and diabetic neuropathy, eczema, psoriasis, acne, , cancer, high cholesterol, heart disease, a movement disorder in children called dyspraxia, leg pain due to blocked blood vessels (intermittent claudication), alcoholism, alzheimer's disease, and schizophrenia. 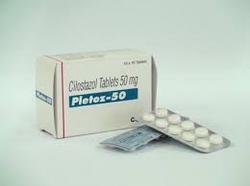 Pletoz(Cilostazol) is used to treat the symptoms of intermittent claudication (leg pain while walking, caused by poor blood circulation). By improving the flow of blood through blood vessels, Cilostazol reduces leg pain while walking, thereby helping people to walk a longer distance. This oral medication works by preventing blood clots and by widening blood vessels in the legs. 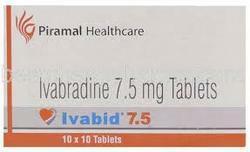 Ivabid (Ivabradine) is a used to treat symptomatic stable angina pectoris (chest pain), chronic heart failure. It can be used in combination with standard therapy, including beta-blocker therapy or when beta-blockers are contraindicated or not tolerated. 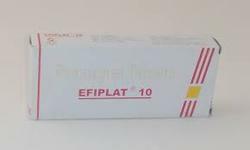 Prasugrel is used along with to prevent serious or life-threatening problems with the heart and blood vessels in people who have had a heart attack or severe chest pain and have been treated with angioplasty (procedure to open the blood vessels that supply blood to the heart). 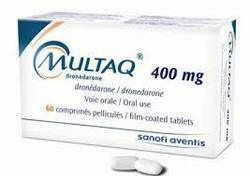 Multaq (Dronedarone) is used in people with certain heart rhythm disorders (such as atrial fibrillation or atrial flutter). It belongs to a class of medications called anti-arrhythmics. This drug treats irregular heartbeats by regulating them and thus helps the heart to beat normally. 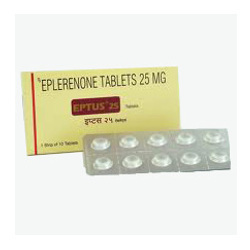 Generic for Eptus (Eplerenone) is prescribed to treat high blood pressure (hypertension), which, if left untreated, can lead to stroke, heart failure or kidney failure. Besides hypertension, this drug is also prescribed to treat congestive heart failure following a heart attack. 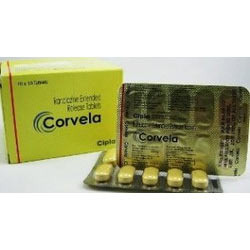 Uses Corvela contains Ranolazine which is used alone or with other medications to treat ongoing angina (heart disease that causes intense chest pain). 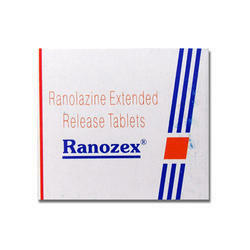 Working:Ranolazine belongs to class of medications called anti-anginals. It works by improving blood flow to help the heart work more efficiently. Ticlopidine (trade name Ticlid) is an antiplatelet drug in the thienopyridine family. Like clopidogrel, it is an diphosphate (ADP) receptor inhibitor. It is used in patients in whom is not tolerated, or in whom dual antiplatelet therapy is desirable. Because it has been reported to increase the risk of thrombotic thrombocytopenic purpura (TTP) and neutropenia, its use has largely been supplanted by the newer drug, clopidogrel, which is felt to have a much lower hematologic risk. The usual dose is 250 mg twice daily by the oral route. Looking for Cardio Drugs ?